Thai January – Week 1 Roundup, Full Steam Ahead! Well what a first week it’s been! 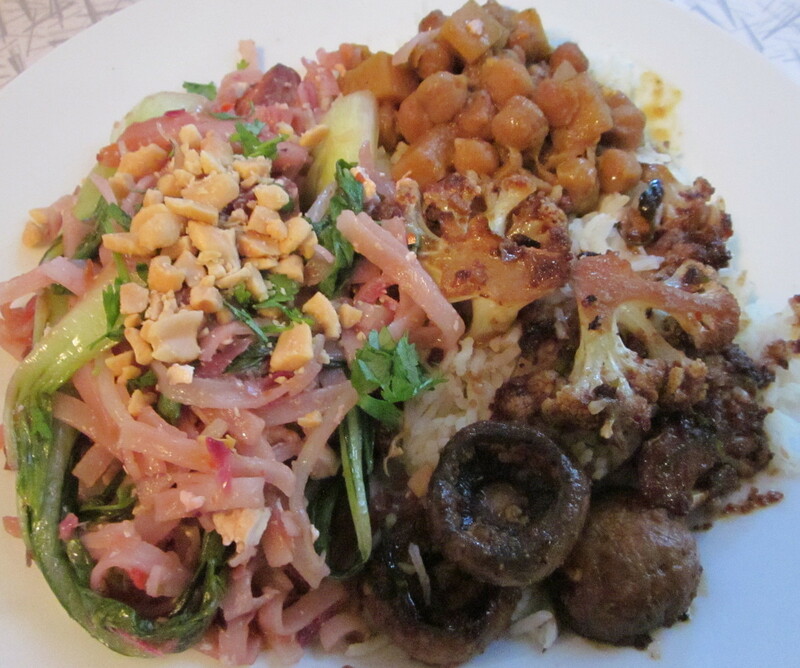 Thai food has been getting churned out of the kitchen on a daily basis, by either Steve or me. 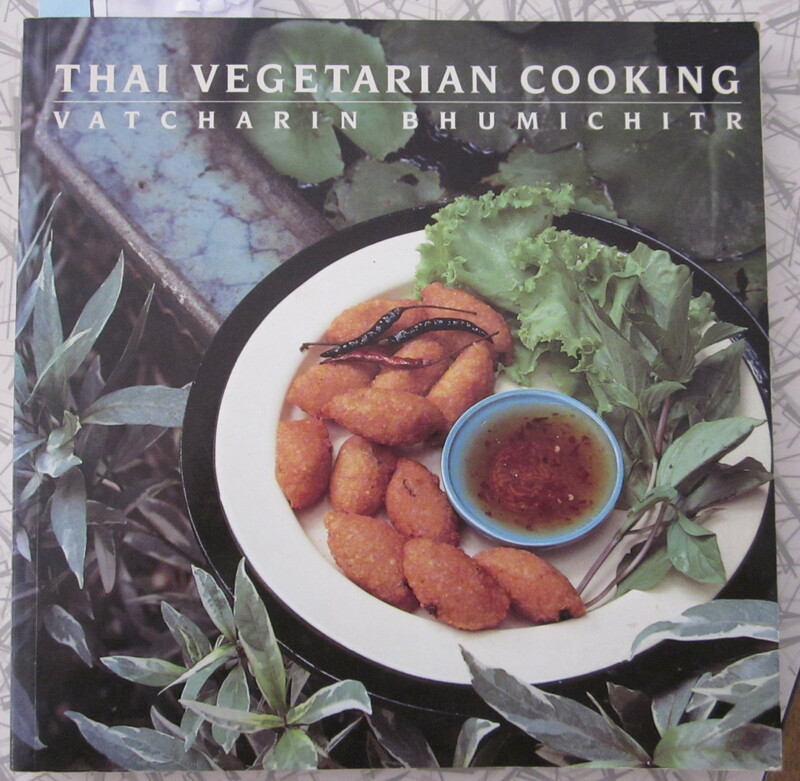 Our guide thus far has been Thai Vegetarian Cooking, which has not been letting us down. I’ve actually had this book among my collection for many years, and I did make a few things from it when I first brought it home, but despite my array of different cookbooks (there are quite a few!) 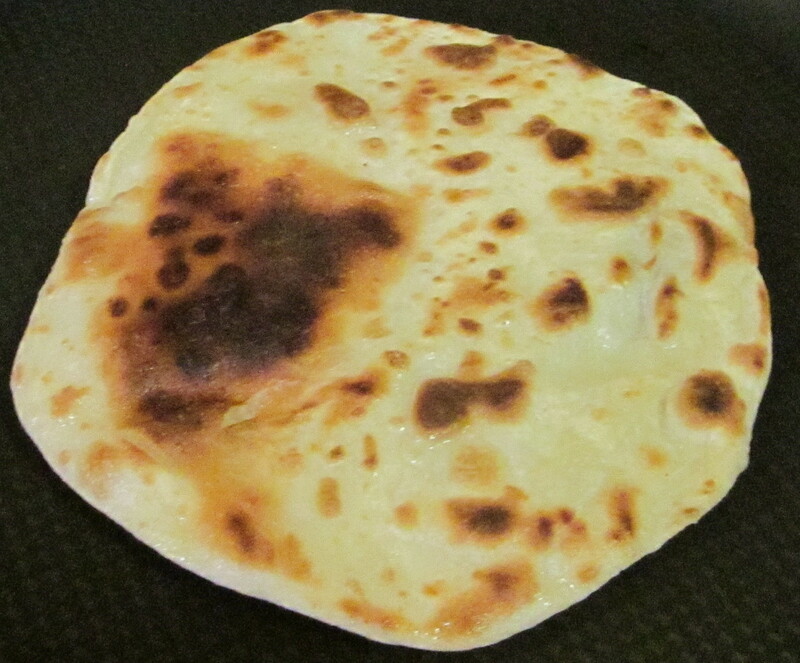 I rarely actually follow recipes, I use them more for inspiration. 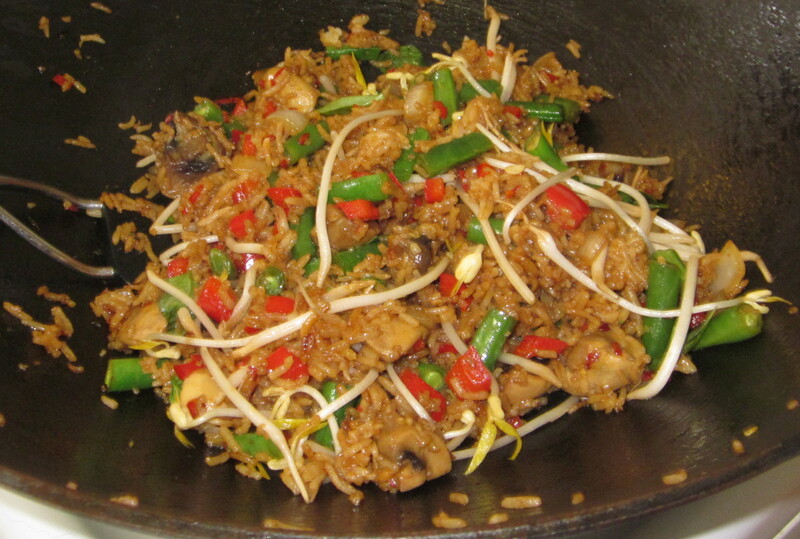 The flavours of Thai food, are amazing, it’s all about achieving that balance of hot, sweet, salty and sour. It’s not subtle, the flavours just burst in your mouth. I think I’m starting to get the hang of it. We had quite a bit left over for our New Year’s feast, so I kept it simple and made fried rice with basil to go with it. You could eat a plate of this on its own. Steve made mushroom and tofu satay skewers to go with the leftover fried rice and the remains of our New Year’s feast. The mushroom and tofu were marinated in this delicious sauce then fried. The satay sauce was served on the side, and is quite different to any we’ve had before. By this time there was only a little fried rice left, so I decided to make some rice paper rolls. The vermicelli noodles were difficult to break apart, so I decided to just soak the whole packet and then use the leftovers to make a salad. There was marinade leftover from the mushroom and tofu satay, so I used that to marinade some tofu for the rice paper rolls, and as a dressing for the salad. 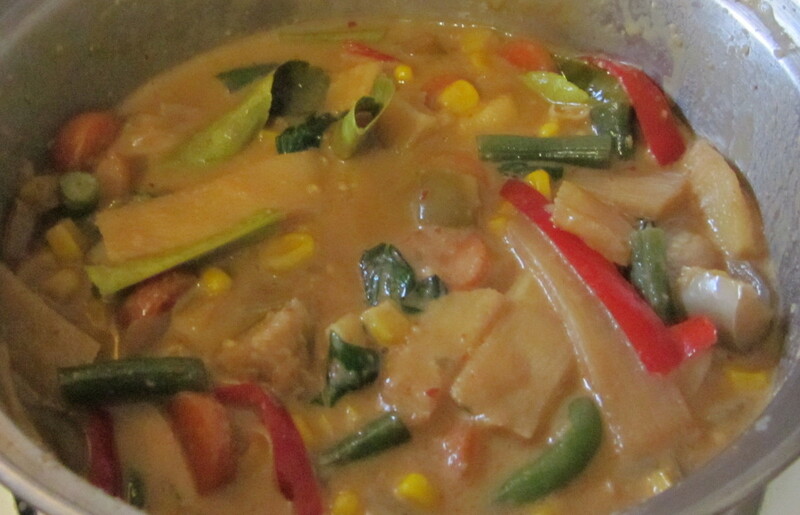 Steve made a double batch of red curry paste, and used some of it to make a red vegetable curry. Oh yum! Homemade paste and the resulting red curry sauce is much less oily than you’d get from anything bought. 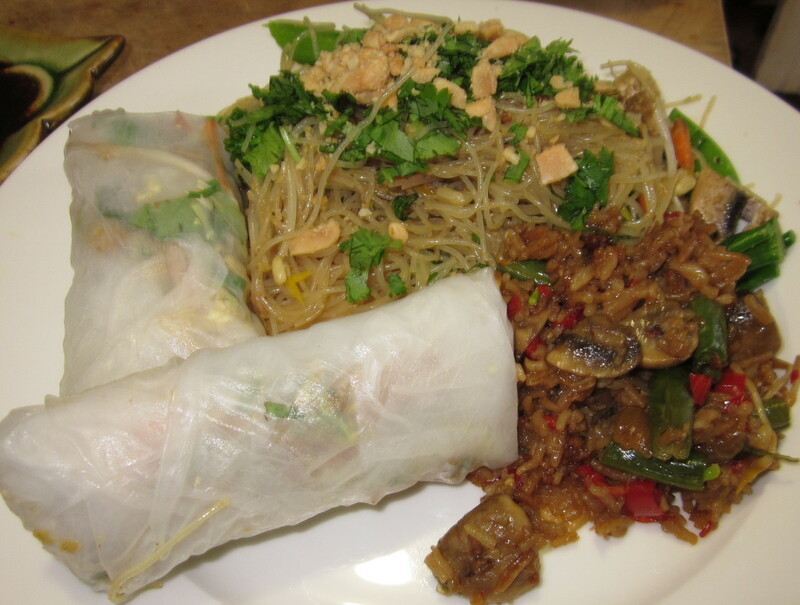 He also fried the remaining rice paper rolls to make spring rolls. Steve took over the kitchen again, and made another batch of the chickpea curry from New Year’s and some Thai roti bread, which was really yummy. I decided to have a go at making Pad Thai. I looked at various recipes, which all varied, and came up with a combination of flavours that seemed consistent with what I’d seen. While it tasted ok, it didn’t taste anything like any Pad Thai I’ve ever had, so will have to go back to the drawing board on that one. I also made up a dry curry with mushrooms and cauliflower. I marinated the vegies in red curry paste and coconut cream for a few hours before frying them and adding some soy, sauce etc. That turned out really rather well. So as someone who doesn’t to really stick to recipes that much, after a week of more or less following along, I was ready to try experimenting. 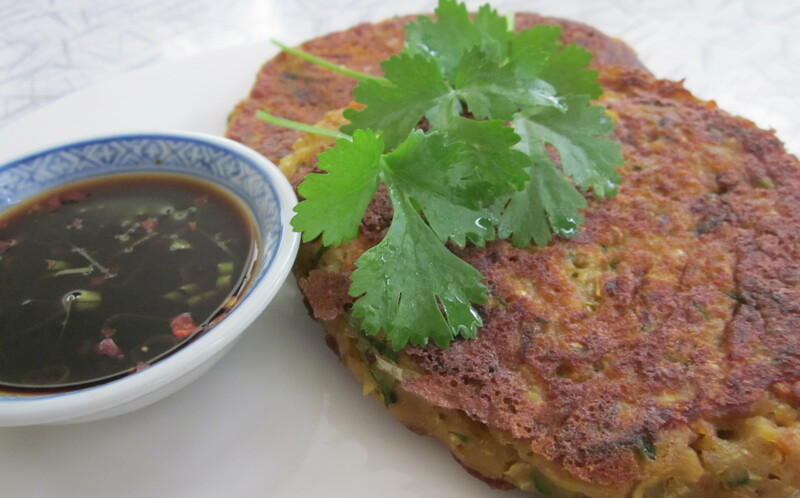 Savoury Thai vegetable pancakes (think a Thai version of Okonomiyaki) – grated and finely chopped vegies in a batter with some typical Thai flavours, fried in coconut oil, and I also made a sauce to pour over the top. Now these I was very pleased with, and will definitely make again. I’m looking forward continuing this journey and experimenting with my own ideas!